For Foodies, spring heralds not just warmer, longer days, but also the opportunity to celebrate the best food from the most passionate growers and producers at the country’s many and varied food festivals. To kick start things, there are a couple coming up at the end of this month for those of us in the south of the country. First of all the Brighton Vegfest happens at the end of this month, then moves to Bristol in May. A full on festival of all things vegan, the weekend includes among other things, cookery demos, film screenings, comedy and yoga area, as well as exhibitors and food village. The same weekend, but in Islington in London, is the Chocolate Festival. Promising the country’s top artisan chocolatiers under one roof, this sounds like a chance for some serious indulgence. The Health Trail features raw and free-from chocs if you feel like staying on the right side of virtuous! The Chocolate Festival, 27th – 29th March, Business Design Centre, Islington, N1 0QH. Imagine having your own chocolate kitchen. Or your own chocolate chef! Apparently King George I had both of these things – one Thomas Tosier ruled over a small but vital room, preparing the King’s chocolate drink every morning, and for special dinners and entertainments. Tosier’s wife, Grace, was also something of a celebrity (see Grace Elliot’s blog here) and traded on her royal connections to promote her own chocolate house in Greenwich! The chocolate kitchen is a recent discovery at Hampton Court Palace and has now been opened up and visitors will also be able to see chocolate making sessions in action. The demonstrations start on 18th April. I’m thinking these are going to be a must-see! No matter whether you’re entertaining that special someone, or treating yourself to celebrate being single, you might as well make sure the food is good! 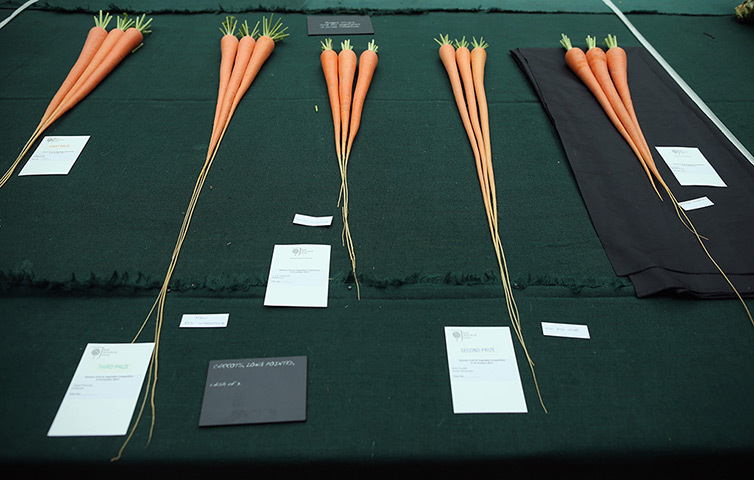 There are some gorgeous (and curious) photos on the Guardian website from the RHS Harvest Festival Show, which took place in the Horticultural Halls in London. 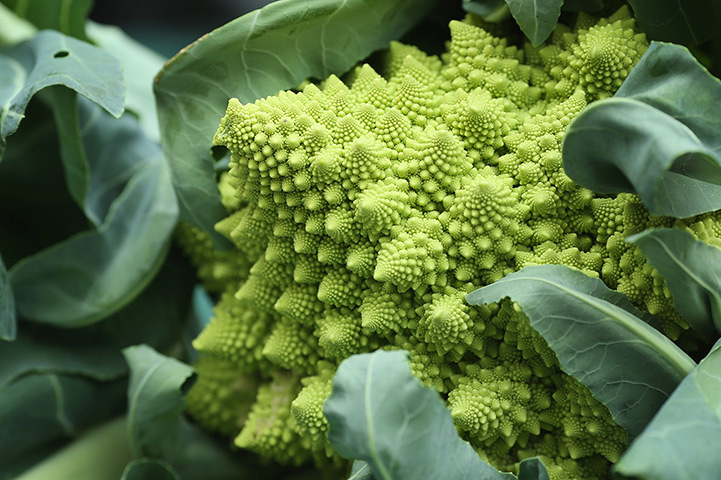 The shots are inspirational, although, as discussed before on these pages, I won’t be entering any ‘biggest vegetable’ competitions any time soon! 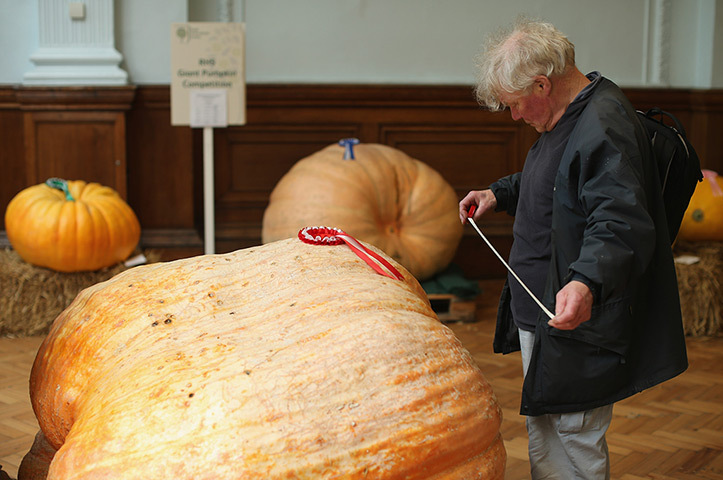 The competition for the biggest pumpkin was won by Stuart Paton’s 327kg (721.4lb) monster veg. A selection of fabulously leggy carrots!